This hike is for the adventurers. 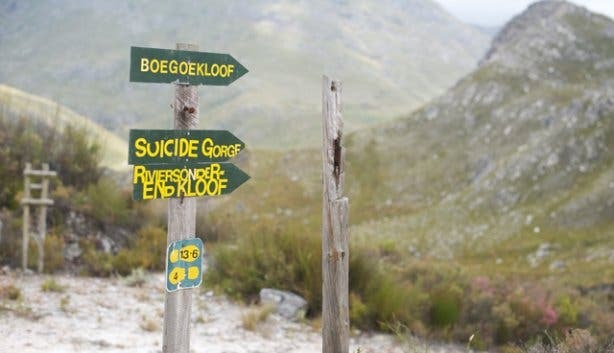 Suicide Gorge is a full day trip (17km, 8 hours) of adrenaline pumping outdoor adventure in the scenic Boland Mountains. 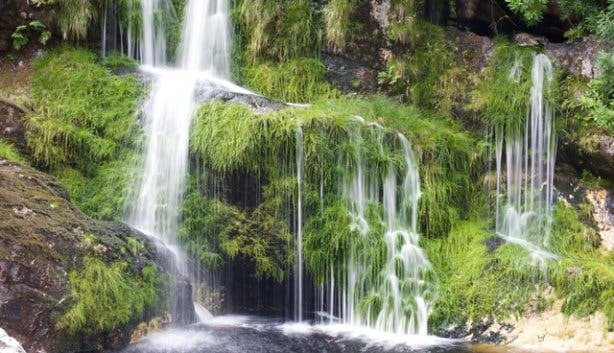 It's a wet hike, ideal for summer, a water wonderland with spectacular canyon scenery, waterfalls and huge jumps. 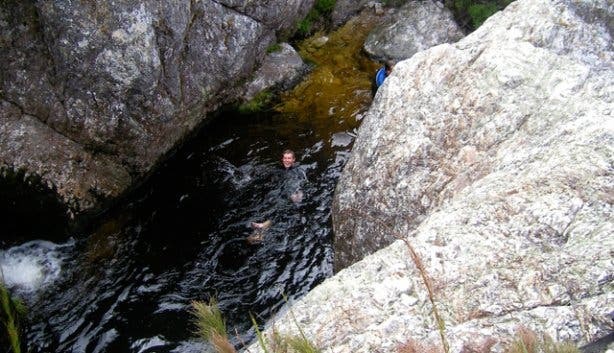 Hike up the rugged gorge, arrive at a series of rock pools and test your courage by kloofing, a combination activity of walking, swimming and jumping. The excitement is jumping off the cliffs into the fresh water. Get ready to jump from huge heights; jumps range from 3 to 20 metres high. If you are a fit, brave and a little wild, kloofing Suicide Gorge will be an unforgettable experience for you. Daring leaps of seven or eight metres down waterfalls are compulsory. You must be willing to swim in cold water and not be afraid of heights. Remember, once in, the only way you're going to get out of this section of the Riviersonderend Mountains is via some gravity-defying jumps and scrambles. 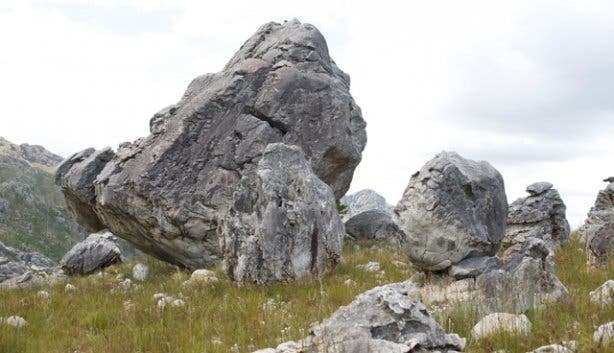 The route is open from 1 November to 30 April; for reservations (permits) call +27 (0)21 483 2949; excursions on Saturdays and Sundays must be booked a month in advance. A shorter booking period is allowed for weekday excursions. Group size: five groups of six people allowed over weekends; groups of 12 to 15 allowed on weekdays. 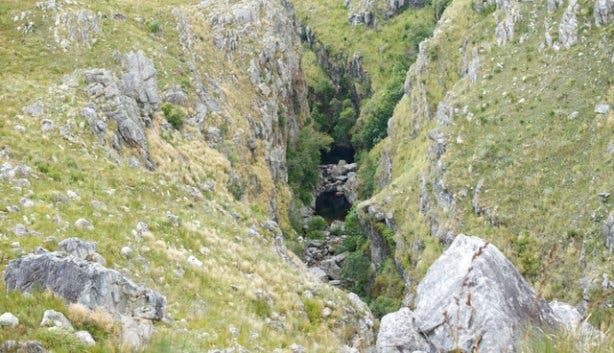 Suicide Gorge lies in the Hottentots Holland Nature Reserve (70 000 ha), 90km south-east of Cape Town. The entrance is at Nuweberg, 11km from Grabouw on the R321. From Cape Town, take the N2, turn left at the Orchard Farm Stall in Grabouw and left again at the Villiersdorp junction. Swimsuit, a quick drying t-shirt and swimming shorts. Cotton is not advised. Remember, this is a wet hike. Wetsuit if you get cold quickly. A change of clothes to leave in the car. Lunch and energy snacks in sealed bags.This hike requires energy. A proper dry bag is highly recommended, bearing in mind that everything will get wet. Waterproof sunblock. There are patches of shade for you to rest in but the majority of the walk is exposed. Start the hike early. Waterproof camera. The views are incredible and you might want your friends taking pictures of you doing the jumps and the other way around. Park your car at the lot next to the starting point of the hiking route (there are changing rooms and toilets). There is good signage, so always hike in the direction Suicide Gorge. 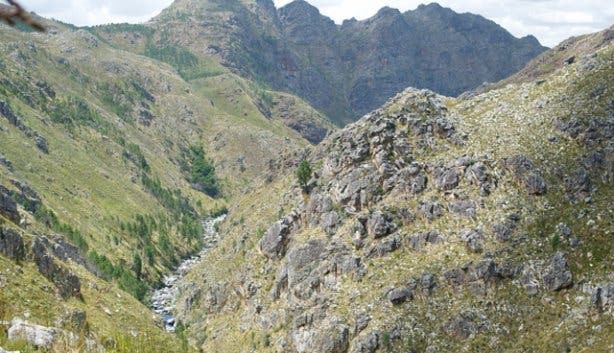 You will hike through a beautiful forest and mountain fynbos before tackling the exhilarating gorge. Follow the course of the river to a junction pool by boulder-hopping, swimming, hiking and jumping into pools from heights of 3 to 20 metres. It is possible to avoid the early jumps and swims by scrambling around the ever present water hazards but don’t miss out on the fun. Once you‘re wet you will pretty much stay wet. From now on it will be jumping and swimming, jumping and swimming. You will not only jump but also slide down on your bum from moss-covered rocks into the waiting pool. 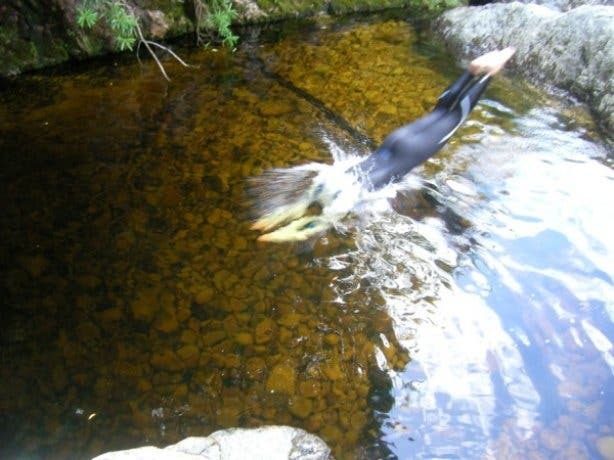 The river is a fast flowing mass of tannin-coloured water, fresh and cool to the taste and refreshing to swim in. There are waterfalls and ancient rock formations shaped by thousands of years of the free flowing river. 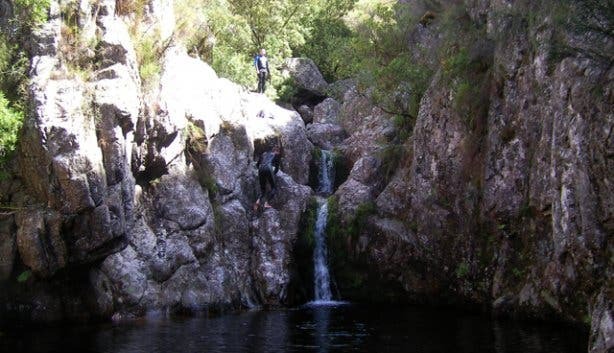 A few jumps, swims, rock scrambles, slips and slides later and you will reach the 'compulsory' high jump. The walk back to the car after hours of walking will feel like a stroll. Duration: Suicide Gorge is a full day trip of 17km, so plan a good 8 hours. 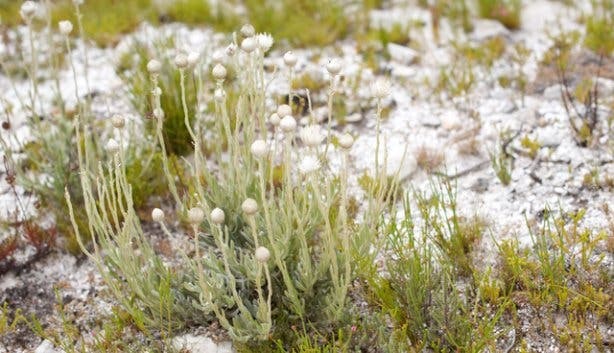 The Hottentots Holland Nature Reserve plays an important role in the conservation of mountain fynbos, with approximately 1300 species occurring, some of which are rare and endemic. You will see king proteas and the wild orchid Disa at the end of summer. Approximately 110 bird species have been recorded, including several species of raptor. Many animals have ben re-introduced, including the rare Cape mountain zebra, eland, bontebok and red hartebeest. Soon visitors will als be able to see the Cape buffalo. Small populations of grey rhebuck, klipspringer, common duiker and grysbok occur and, while Leopard frequent these mountains, they are seldom seen. People agree: the gorge itself is stunning and the death defying jumps aside, Suicide Gorge probably deserves a better name. P.S. 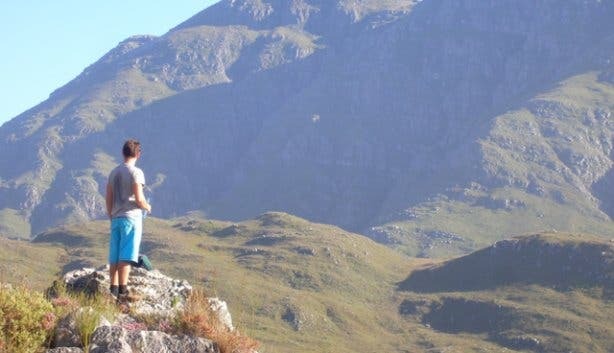 There are other great hiking routesin the Hottentots Holland Nature Reserve that are not as extreme. If you loved this, then you'll enjoy visiting these 7 Natural Rock Pools For Adventure Junkies. You might also want to look through our selection of Hikes and Hiking Trails. And here are more Extreme Adenvture Sports you might enjoy.